I’m reposting this from another blog I wrote for Regenerative Finance, an investor collective I’m a part of that is redistributing wealth. I’ve been thinking a lot lately about land and how it relates to investment and how it’s often not included in discussions around investment. The cover image is a photo I took near my home in the prairies of Illinois. SRI and impact investing will tend to focus on cash. Continuing to ignore other types of assets is colonial. Investing in land is reliant on historical and continued genocide, forced assimilation, colonization. Capitalism rooted in colonialism erases or downplays the importance of land and “natural resources” as foundational to growth. One of the major ways to turn land into a natural resource is called commodification — or the process of turning something into a commodity by converting it from its original form to a value that can be measured in dollars. “Imagine this design assignment: design something that makes oxygen, sequesters carbon, fixes nitrogen, distills water, accrues solar energy as fuel, makes complex sugars and food, creates microclimates, changes colors with the seasons, and self-replicates. All of this is a long-winded way of saying that trees are – for a variety of reasons – magical. Capitalism takes these magical beings and turns them into something that can be traded on a market – paper, lumber. Occasionally, economics can understand “environmental services” – more of the things that McDonough was getting at – the valuing of sequestering carbon, and then complicate the tree’s value, as well as make a stronger economic argument to keep it alive and healthy. By the way, this is all reliant on a lot of separations within nature. Trees are separate from birds that live in them, separate from the soil and water and fungal networks that nourish them. We are separate from them. This relies on separating us from nature, from our other ways of relating, and the interrelatedness of its parts. Other related ideas include water investment and privatization, carbon trading and treating land itself as property. United States history is different than the history of the land that the U.S. currently occupies. Who was here before the “start”? How is their deep history erased by current narratives that start history at 1776? How does our understanding of the U.S. as one nation erase the hundreds of other sovereign nations that also currently inhabit this land? “Counter to the western stories that we’ve been here 12,000 years, we’ve been here over 60,000 years, likely over 100,000 years, and there is a great deal of evidence to support that,” says Paulette Steeves, director of the Native American Studies program at the University of Massachusetts Amherst. A more complicated understanding of history that many of us did not receive in school is necessary to understand the depth of relationship that indigenous people have had and many continue to have with this land currently called the United States for thousands of years. In contrast, the colonized period of this land is relatively small, a few percent of total peopled time. Investing isn’t just about money. All capitalism relies on commodification of nature and land and the genocide required to do those things as well as direct investment in land. Wealth redistribution tends to focus on dollars and donation of money. International land grabs are kind of a big deal too. The Oakland Institute has some great resources on that topic. It’s imperative that our interpretation of investment be broadened to also encompass land. Investment in land doesn’t have to look like owning a real estate property, there are lots of ways to invest. And certainly all of capitalism happens on land anyway. The process of commodification – turning trees into paper, into an abstract commodity that can be bought and sold – is the process of disconnecting ourselves from place, of literally uprooting ourselves and nature and abstracting it into something else. In its very nature, this is colonial — it is void of a sense of place, a sense of context, history, and connection. There’s a strong connection to present-day gentrification and displacement – these are not new concepts. This is also super connected to the gentrification that’s happening around the country (and many parts of the world) as people move around. The idea that people are movable, easily displaced, that a value connected to a place will drive people out of being able to live there — rooted in racialized colonialism. Land is not arbitrary. Things like “equal redistribution of land” or “land as commons” are colonial concepts that continue to erase deep relationships of indigenous people to *specific* places. For a really basic idea of what I mean here, think about a place you call home. About how it smells, about the plants that live there and how they change over the course of a year. About all the people you are connected to in that place. That place can’t be anywhere, it’s a specific place to you with many histories. 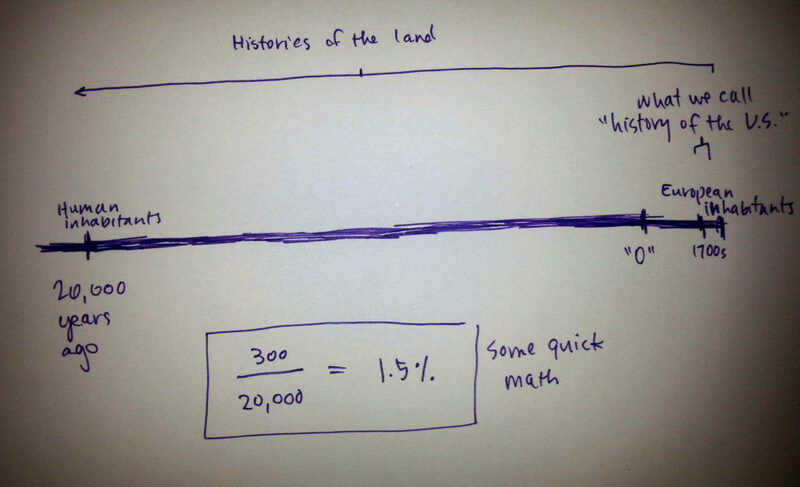 Multiply that by 20,000 years and then it might be similar to indigeneity. One example of a land reparations project I’m familiar with locally is an indigenous women led project called the Sogorea Te Land Trust. It asks settlers on Chocheño Ohlone land to pay a “tax” to fund the purchase of land to be stewarded and used in ceremonial practices. There are several other indigenous led land trusts around the country. I’m going to leave you here with a few resources, some questions to consider, and let you know some of the questions we’re currently holding as Regenerative Finance. Want to be in conversation with us?? Far out! Drop us a line. Do you have investments in land? What does that look like? REITS, a home you live in, homes you don’t live in, relationships to real estate developers, buildings, infrastructure, …? Do you have investments that are involved in the commodification of land? Whose land are your investments on or in? What’s your relationship to those people? What’s your current relationship and ideal relationship? What has your family’s historical relationship to land been? All of our wealth was extracted from land, what were the steps in that process, and how does that feel? What are you going to do about it? How does land fit into regenerative investing? If a project we work with is not indigenous-led, what would it need to do to be decolonized? Given that so much wealth is accumulated through direct investment in land, what are we doing about that? How do we take this message as settlers to other settlers? How do we continue to bring this topic up in the impact investing scene?